Nike Air Zoom Structure 19 are stability cushioned running shoes. The Nike Air Zoom Structure 19 features great cushioning and stability for runners with overpronation looking for an everyday training shoe also valid for racing mid/long distances. 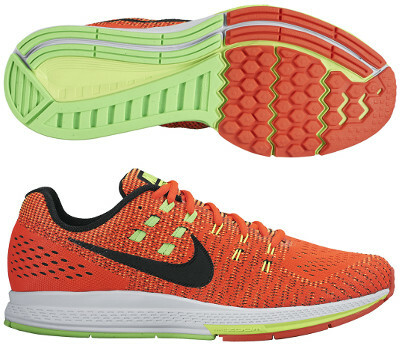 The Air Zoom Structure 19 is one step below Air Zoom Odyssey regarding pronation control and cushioning. Major change in current version from its predecessor Air Zoom Structure 18 is the improved fit in the Flymesh upper with more Flywire cables (some of them get flattened) for better adaptative support around midfoot. The triple density pronation control system in the midsole remains almost unchanged in the Air Zoom Structure 19 for great stability on transition. Zoom Air® unit is only available in the forefoot (another one in the heel in the Odyssey) for more responsive ride. Also no changes in outsole with flex grooves and lateral crash rail for smoother and more natural movement.